If you want to maximize your efforts and lose all that excess fat you have in your belly, arms and legs in record time, the Yes You Can!TM Diet Plan Fat Burner is perfect for you. This unbelievable natural supplement was created by our team of experts who took the best ingredients form the leading fat burners in the market and put them into one amazing product that has no dangerous side effects or threats to your health*. Our fat burner is perfect for everyone*, you don't have to exercise all day or be an athlete in order for the product to work. All of its natural ingredients will help you destroy and remove excess fat in your body. If you really want to speed up your weight loss and make your transformation happen fast, then help your efforts with the Yes You Can!TM Diet Plan Fat Burner. 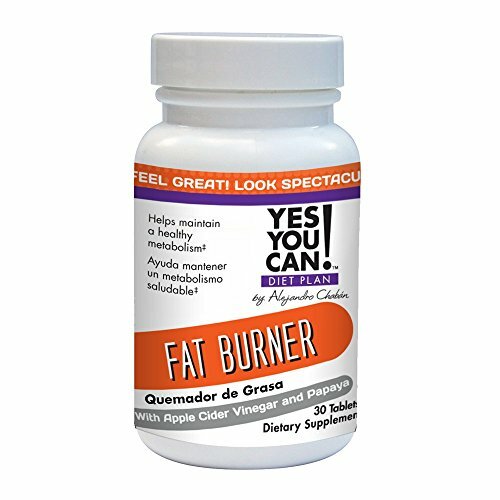 Fat Burners are weight loss supplements that help increase thermogenesis, a process that burns fat by converting it to heat. The Yes You Can!TM Diet Plan Fat Burner is not only a supplement to lose weight, but it can also help suppress the appetite. Our Yes You Can!TM Diet Plan Fat Burner does not have any side effects such as insomnia, paranoia, jitters, depression or blood pressure hikes as it is made with 100% natural ingredients. Additionally, it helps you destroy fat cells in the body and eliminate them organically through the urine. "L-CARNITINE: L-Carnitine is an amino acid that transports fat into cells to produce energy, it breaks down the fat cells in your body and turns them into fuel that you use to increase your muscle mass and burn calories a lot faster. It has also been proven to help reverse and control some symptoms of hyperthyroidism in patients of all ages*"
If you have any questions about this product by Yes You Can! Diet PlanTM, contact us by completing and submitting the form below. If you are looking for a specif part number, please include it with your message.